September | 2015 | Katstar Inc. Whether you’re working as an office manager, you have a small business of your own or you simply want to set up a home office, office supplies are a necessary and often expensive element. As you know, when running a business, every dollar spent counts. Generally speaking, purchasing your office supplies at a conventional office store is unfortunately the most expensive option for purchasing supplies, and somehow, this is still the option that most people choose. Furthermore, ink cartridges can be the most expensive of your office supplies yet one of the most essential to have in stock. It’s likely that you have heard about or even experienced the absolutely insane prices of ink cartridges. High-quality printer ink is basically the Holy Grail of computing; it’s like a legend, just out of grasp. This illusive printer ink is like the calorie free beer that retains all of the flavor, the cheap all-inclusive trip to an exotic beach front 5-star resort—it seemingly doesn’t exist unless you really luck out. Printers themselves are usually quite cheap, paper is a little more expensive, but it is the ink that really gets you. Ink is basically liquid gold. Thus as an office manager or business owner knows that printer cartridges and other printer supplies are the areas where your budget can get hit the hardest. 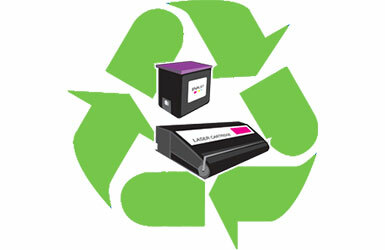 First- NEVER EVER toss your e mpty ink cartridges in the garbage. Not only is this harmful for the environment, but you are basically throwing out money. There are a several ways that you can recycle your empty ink cartridges—you can even SELL them for money. Second- you should rely heavily on your printer’s draft-quality setting to save ink. Pretty much every modern printer these days has this setting. You shouldn’t use draft mode for printing photos, but for many other printing tasks, draft mode gets the job done. Finally, do your research. There are many companies out there that offer deals on ink cartridges and printer supplies and/or have discount programs for eligible customers—but none of those companies compare to Katstar! We offer our products at competitive and affordable prices in addition to our discount programs. So if you’ve done your research then you know, at Katstar you’ll find all the printing supplies that you need at the best prices that you’ll find.